For Novak Djokovic, a season that got off to a gloomy start is heading for a brilliant finish after he dismissed Juan Martin Del Potro 6-3, 7-6 (4), 6-3 to win the US Open. 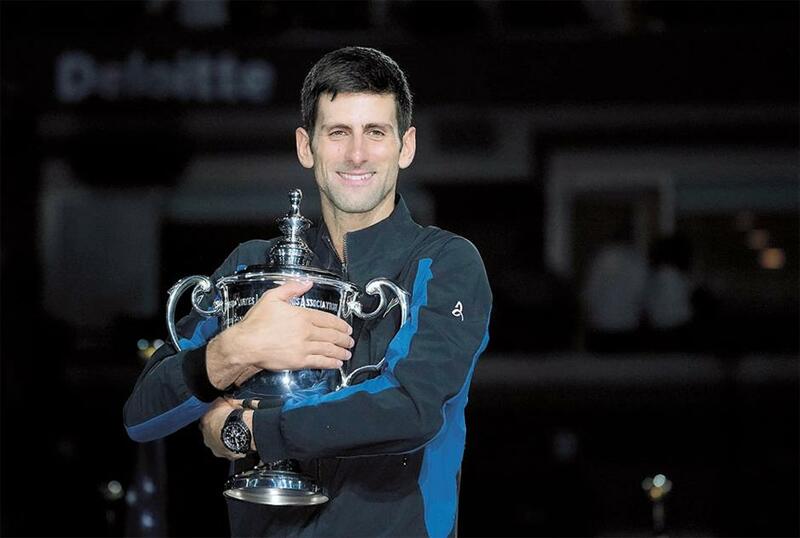 Novak Djokovic of Serbia poses with the US Open trophy after beating Juan Martin del Potro of Argentina 6-3, 7-6 (4), 6-3 in the final at the USTA Billie Jean King National Tennis Center in New York on Sunday. For Novak Djokovic, a season that got off to a gloomy start is heading for a brilliant finish after he dismissed Juan Martin Del Potro 6-3, 7-6 (4), 6-3 to win the US Open on Sunday and earn back-to-back Grand Slam titles. Working his way back from elbow surgery he underwent following the Australian Open, Djokovic didn’t expect to feature in the GS picture this season. But in the last eight weeks the 31-year-old has resembled the GS machine that held all four major titles at the same time in 2016, wining three of his last four events, including Wimbledon and US Open. “If you told me in February this year when I got the surgery that I’ll win Wimbledon, US Open, and Cincinnati, would be hard to believe,” said Djokovic, after pushing his career total to 14 GS’s to sit equal third with Pete Sampras on the all-time list. The sixth seed had suffered in the ferocious heat and humidity through the early days of the season’s final GS in New York but dropped only two sets for the tournament and none since the second round. Playing on the same court where Sampras claimed his 14th and final GS crown, Djokovic has endured more disappointment than joy on Arthur Ashe, winning three titles from eight finals. Djokovic and Del Potro walked onto Arthur Ashe Stadium court with the USTA Billie Jean King National Tennis Center still buzzing over the controversial women’s final on Saturday, won by Japan’s Naomi Osaka after Serena Williams incurred three code violations. The tension and fireworks of the Osaka-Williams clash were left behind during a relatively calm and composed baseline battle between two friends and familiar foes, who had played each other 18 times, with Djokovic holding a 14-4 edge. While there was joy in victory there was none to be taken from beating a teary Del Potro, who knows the pain of a comeback having undergone four wrist surgeries that caused him to miss 14 majors and at one point looked to be derailing his career. Del Potro’s sole GS title came at the 2009 US Open and he said it had been an emotional journey back to the Flushing Meadows final. “I’m very sad for being a loser today but Novak deserved to take the trophy,” said Del Potro, who wept into his hands before being comforted by Djokovic. “I was playing almost at the limit all the time, looking for winners with my forehands, backhands, and I couldn’t make it because Novak was there every time. The worst part to me is the chances that I couldn’t make but then when you see a friend holding the trophy, it’s good, too.